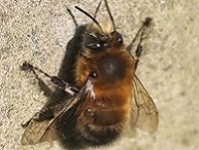 This species is one of the first solitary bees to emerge in spring and people often confuse them for small bumblebees, although their quick darting flight motion is a good way to tell them apart. Males and females look very different from each other. 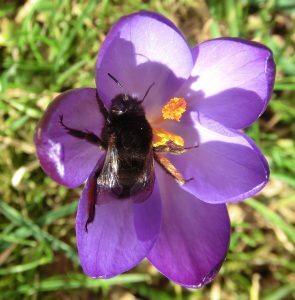 Although they are solitary bees (with no workers or social structure) they often nest in large groups, which can be quite noisy. Males are pale gingery brown in colour with distinctive cream coloured hair on their faces. They also have distinctive feathery hairs on their legs/feet which is where this species gets its name from. These bees can often be seen patrolling areas of flowers in the hopes of finding a mate and chasing other insects off their territory. Females are very different to males, they are black all over, except for orange/red hairs on their hind legs. 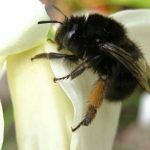 Once they have successfully mated, they can be seen collecting pollen which they gather on their hind legs and transport back to their nest cells. They lay an egg in each cell, provision it with enough pollen to feed the larvae and then seal it up to allow their young to develop until next spring when the cycle starts again. Frequently found in urban greenspaces, parks, gardens, and woodlands. Nests tend to be shallow hollows in soft mortar, cob walls, exposed vertical soil profiles or soft cliff faces, and occasionally in the ground in compact clay soils. Frequently seen visiting lungworts, primroses, dead-nettles and comfrey. Seen February to June. Found throughout most of England and Wales, but more common in south and east. Increasing records from northern England and some parts of southern and central Scotland. Every year we receive lots of enquiries from people who find these bees inside their homes, despite all the windows and doors being closed. This is usually because the bees have nested in the soft mortar around the chimney stack and accidentally end up falling down the chimney. If this happens you can gently usher the bees outside again so that they can complete their life-cycle.